Chiari malformation (CIM) presents an interesting pathology, affecting both children and adults. It is described as a downward displacement of the cerebellar tonsils through the foramen magnum (Fig 1). This downward displacement of the cerebellar tonsils (more than 5-7mm below the foramen magnum) is the primary cause of signs and symptoms observed. This herniation can be a result of congenital or acquired malformations. There are several theories yet to be proven behind the development of congenital CIM. These include aetiologies such as small posterior fossa, hydrodynamic insults, hindbrain dysgenesis, underdevelopment of the basiocciput, lack of ventricular distention, and genetic causes . Aetiology for acquired CIM may include trauma, craniosynostosis or intracranial mass lesions just to name a few . Fig 1. MRI T2 sagittal cervical spine. Downward displacement of the cerebellar tonsils. Many CIMs are discovered incidentally, and have no associated signs or symptoms . The prevalence of asymptomatic CIMs is estimated at 15-37% [4, 5]. The signs and symptoms associated with symptomatic CIM include pain, headache, elevated intracranial pressure, syringomyelia, cranial neuropathies, brainstem compression, cerebellar dysfunction, cervical myelopathy, and sleep related breathing disorders . 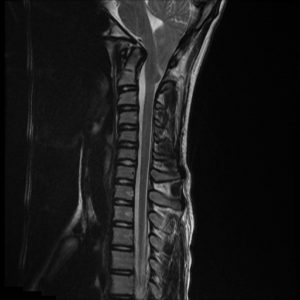 Syringomyelia is an important pathology related to CIM occurring in 30-70% of cases [7, 8]. It can cause symptoms of sensory changes, scoliosis, and proprioceptive loss. Pain and headache is the most common symptom associated with symptomatic CIM, reported in approximately 60-70% of cases [3, 4, 9, 10]. The pain is described in the occipital or upper cervical region, and is often exacerbated by coughing, sneezing, laughing and changes in posture . Less commonly, cranial neuropathies and brain stem compression may result in respiratory tract symptoms (vocal changes, dysarthria, tongue atrophy, aspiration) and sleep disorders (central and obstructive sleep apnoea). Signs of autonomic dysfunction (sinus bradycardia, syncope, hiccups), sensorineural hearing loss, weakness, spasticity, hyperreflexia and upgoing Babinski reflex have also been described. There are several types of CIM described. Type II CIM involves a herniated cerebellar vermis, brain stem and fourth ventricle, in addition to cerebellar tonsils. This subgroup represents a much smaller proportion of CIM . Type II CIM is almost always associated with myelomeningocoele as well as Klippel-Feil anomalies, and incomplete closure of the posterior arch of the atlas. The treatment of asymptomatic CIM is largely conservative. Surgical treatment should be considered in patients with associated CIM headache symptoms impacting quality of life, large or enlarging syrinx, or objective abnormal neurological findings or myelopathy. The most common surgical approach is a cranio-cervical decompression. This involves removal of part of the occipital bone extending to foramen magnum, and may also include removal of posterior C1 arch, decompression with arachnoid opening followed by duroplasty (Fig 2&3). Other surgical options include bony decompression alone, of cerebellar tonsil coagulopathy or resection. Fig 2&3. 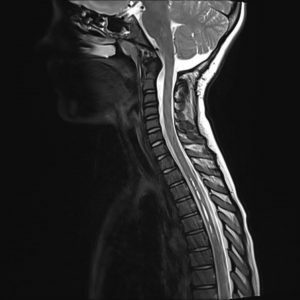 Preoperative and postoperative MRI T2 sagittal cervical spine. Fig 2: Preoperative image shows mild tonsillar ectopia with prominent cervical syringomyelia. Fig 3: Postoperative image shows adequate craniocervical decompression and significant reduction in cervical syringomyelia. Significant progress has been made in recent years in treatment of Chiari malformations. However this disease remains a curious pathology and there are still many key questions yet to be answered. (1). Milhorat TH, Nishikawa M, Kula RW, Dlugacz YD. Mechanisms of cerebellar tonsil herniation in patients with Chiari malformations as guide to clinical management. Acta Neurochir (Wien). 2010;152:1117-27. (2). Cesmebasi A, Loukas M, Hogan E, Kralovic S, Tubbs RS, Cohen-Gadol AA. The Chiari malformations: a review with emphasis on anatomical traits. Clin Anat. 2015;28:184-94. (3). Tubbs RS, Lyerly MJ, Loukas M, Shoja MM, Oakes WJ. The pediatric Chiari I malformation: a review. Childs Nerv Syst. 2007;23:1239-50. (4). Benglis D, Jr., Covington D, Bhatia R, Bhatia S, Elhammady MS, Ragheb J, et al. Outcomes in pediatric patients with Chiari malformation Type I followed up without surgery. J Neurosurg Pediatr. 2011;7:375-9. (5). Pindrik J, Johnston JM, Jr. Clinical Presentation of Chiari I Malformation and Syringomyelia in Children. Neurosurg Clin N Am. 2015;26:509-14. (6). Sarnat HB. Disorders of segmentation of the neural tube: agenesis of selective neuromeres. Handb Clin Neurol. 2008;87:105-13. (7). Massey SL, Buland J, Hauber S, Piatt J, Jr., Goraya J, Faerber E, et al. 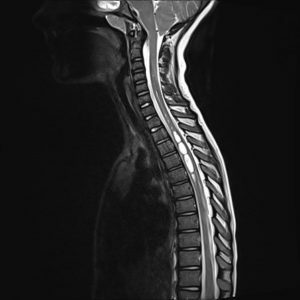 Acute VI nerve palsy in a 4 year-old girl with Chiari I malformation and pontomedullary extension of syringomyelia: case report and review of the literature. Eur J Paediatr Neurol. 2011;15:303-9. (8). Milhorat TH, Chou MW, Trinidad EM, Kula RW, Mandell M, Wolpert C, et al. Chiari I malformation redefined: clinical and radiographic findings for 364 symptomatic patients. Neurosurgery. 1999;44:1005-17. (9). Tubbs RS, Beckman J, Naftel RP, Chern JJ, Wellons JC, 3rd, Rozzelle CJ, et al. Institutional experience with 500 cases of surgically treated pediatric Chiari malformation Type I. J Neurosurg Pediatr. 2011;7:248-56. (10). Paul KS, Lye RH, Strang FA, Dutton J. Arnold-Chiari malformation. Review of 71 cases. J Neurosurg. 1983;58:183-7.